3D printing medical devices and implants for patients is now rapidly proliferating through the field of surgical medicine, creating a sweeping revolution in modern medicine. Presently, with the help of advanced 3D imaging technology and well-adapted GPU processors to capture and manipulate that information, many hearing aids and dental crowns are now being 3D-printed to a custom fit for the patient, as well as one-time use, custom surgical instruments and even prosthetic limbs for amputees. The technical term for 3D printing is additive manufacturing, because it adds material in layers to manufacturer a complex 3D object of any shape from a digital design file on a computer. Nine months later, New Balance put pay to those words with Zante Generate, the world’s first high-performance running shoe with a full-length 3D printed midsole. In tribute to chairman Jim Davis’ 44 years of New Balance ownership, 44 pairs of the shoe were produced at the company’s Lawrence, Massachusetts, facility in collaboration with 3D Systems. The Zante Generate was made possible by 3D Systems Selective Laser Sintering (SLS) printers and DuraForm® Flex TPU material. For the day-to-day quest to fulfill the “Always in Beta” philosophy, New Balance relies on 3D Systems ColorJet Printing (CJP) for color and form prototyping. If you’re simply trying to keep up with demand or leverage the latest manufacturing techniques while exploring ways to lower production costs, look no further. Skip the silicone rubber mold and shorten your jewelry design-to-manufacturing process by 3D printing detailed yet durable wax patterns quickly. Directly produce high quality, intricate jewlery wax casting patterns with exact, razor-sharp edges, fine feature definition and the smoothest surface finishes to minimize hand finishing. 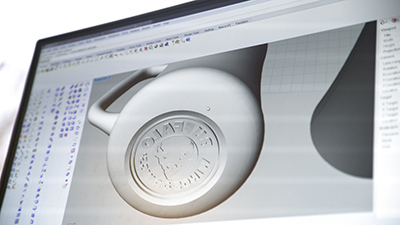 Eliminate tooling time, costs and geometric limitations, and optimize parts and labor costs with automated and efficient processes – from file to finished direct casting pattern. FAST PRINT SPEEDS – Get up to 10X faster print speeds compared to similar class solutions, with capability for short production runs throughout a work day. HIGH CAPACITY – With a 3.7X larger build volume capability than alternative similar class printers, gain high productivity and efficiency with 24/7 operation.